Leesa Jing is the marketing and communications intern for summer and fall 2015. She manages the advocacy efforts of TheSororityLife.com initiative, including writing newsletters, updating the website and posting to social media. About Leesa: Leesa is from Evansville, Ind. 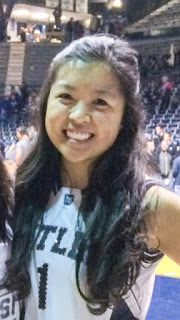 and is a junior at Butler University, where she’s majoring in arts administration and mathematics. She has an older sister, 23, and has two small dogs she loves taking for walks. She is a member of Alpha Chi Omega and the university dance team. She also serves as a campus tour guide. Interesting fact: I almost died from a bowling ball. I was on stage at a magic show and the ball accidentally fell from the ceiling. It landed less than a foot away from me! What do you most enjoy about working at NPC? I love having the opportunity to learn new things. As an arts administration major, I take only a few communications classes, so this internship is a learning experience. I also love that everything I’m learning at NPC is interesting to me. What is something you do every day? I try to work out. My day doesn’t feel complete without going to the gym. What is your favorite book? My favorite book is "The Help" by Kathryn Stockett. What have you gained by being a member of a sorority? Being a member of a sorority has affected me in so many positive ways, but I think the two main things I have gained from Alpha Chi Omega are lifelong friendships and leadership experience. Some of my closest friends are from my sorority, and I never would have met them otherwise. My sorority has also a helped me grow as a leader by presenting me with many opportunities. I’m currently Alpha Chi’s recording secretary and sustainability coordinator, and I’m a Panhellenic recruitment counselor. These experiences would not have been available to me if I weren’t a sorority member.